Korean students are smart. They consistently rank among the top performing students in the world, especially in math, but it’s no surprise, given their study habits and sheer relentlessness. A majority of my students tell me they like math. The goal for many of these students is to either study at one of the SKY universities or to study abroad. 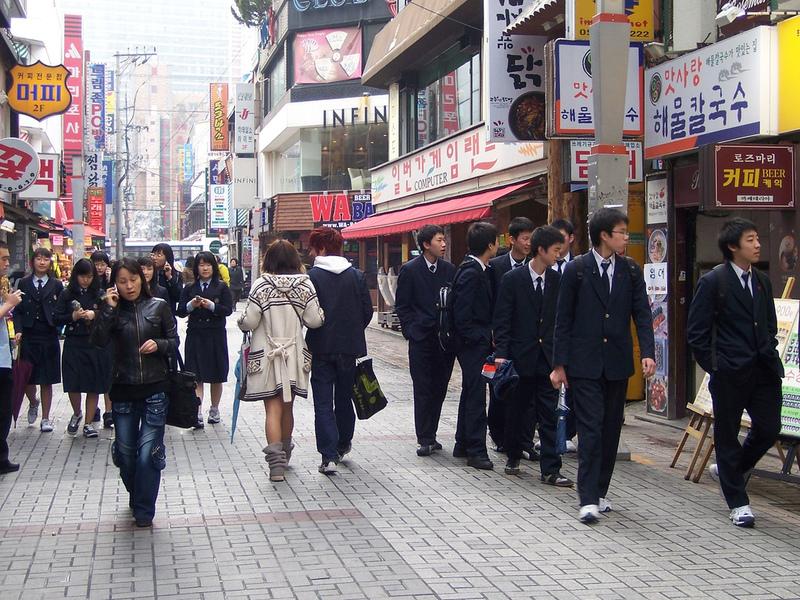 Korea sends more students to study abroad than any other country, about 350,000 total. According to the NY Times, South Koreans are the largest group of international students in the U.S. The following is my attempt to describe a typical day in the life of a fictional Korean middle school student. This comes from what students have told me while using their second language (English is fiendishly difficult for Korean kids, but even the younger students can make themselves understood). Keep in mind that I’m talking about hagwon students. Even though private hagwons are affordable for middle class families, not all Korean students are able to attend. In other words, these kids are born with an initial advantage over their non-hagown peers (See also Accidents of Birth). That said, let’s have a look at the typical day in the the life of a fictional Korean middle school student. My School Day, by Park Hyeun Jung. Monday to Saturday, I wake up around 6:30 to 7:00. Eat a quick breakfast of rice and seaweed soup, put on my uniform, and walk to school. Some of my friends have to take the city bus, but I’m lucky. My classes are math, science, Korean language and literature, morality, social studies, English, physical education, music and art. Math is my favorite, though I like social studies, too. I do a couple hours of self-study in the morning. During this time I usually work on assignments from my afternoon classes. At lunch, I get to talk to my friends. I finish around three. When I leave, I’m pretty hungry. If I have any pocket money, I’ll buy some food from the old lady’s snack cart. I don’t get to eat until I get home. From three until five, I do self-study at the library. I try to finish up my hagwon homework. Some of it is pretty hard, but it’s helping me become a better student. Besides, if I don’t finish, the teachers will call my mother. That’s never fun. I go to hagwons for math, science, and English, one each. Some of my friends go to two different hagwons for each subject. Three days a week, I have English and math. Two days a week, science and Korean hagwon. I spend a couple hours at each one. In math, we’ve been working on geometry, and that’s pretty fun. English hagwon is okay, though the foreigner teachers smell funny. At least they don’t give too much homework. I think they’re lazy but I get to talk a little bit. For my Korean teachers, we mostly memorize vocabulary and translate articles. I get home from the hagwons at about 10pm. I used to stay later, but the government recently passed a law that says all hagwons have to close by 10pm. At home, I’ll eat a little dinner with my family. Dad is usually home to eat with us, but sometimes he has to work late and I don’t even see him; he leaves before I’m awake and gets home after I’m in bed. After dinner, I study and do homework. We recently moved to a bigger apartment so my sister and I could have a room just for studying. Tonight, she’s working on English homework; she has to translate four pages before class tomorrow. I’ve got to get ready for a math test at the end of the week, so I’ll probably study until about one or two. I’m so tired, and all I want to do is sleep, but I’ve got to finish. My future will be ruined if I don’t. As a westerner, it’s easy to say these kids are being worked too hard, that they don’t have any free time to play or to develop their own interests. Yet, it’s not my culture and I’m not a researcher. I’m just an outside observer, and an ignorant one at that. A full comparison of Korean vs. American education is waaay beyond the scope of this article. (Here’s an article dealing with the negative impact of the hagwon industry). However, I’d like to think I’ve learned a few things about learning from my ever-gracious host country. Sometimes rote memorization has its place; some information simply has to be learned by heart. You can’t Google foreign language vocabulary or math formulas. Your friends and peers influence you more than you think. When all your peers are so hard-working, it’s shameful to be lazy. You don’t need expensive courses and fancy technology, you just need to put in the time, work, and energy. On education, South Korea spends half as much as the US but gets better results. The less free time you have, the more valuable it becomes. Make the most of what you’ve got. In the West, elbow-numbing hard work is underrated. Sometimes you just have to push yourself really damn hard. Today, Korea is a modern, industrialized country, but according to the OECD (via the BBC), 40 years ago, Korea’s national wealth was the same as that of Afghanistan, one of the poorest countries in the world. How did Korea pull itself out of that mess? They rolled up their sleeves, built a bunch of factories, looked to the outside world, studied hard, and outworked almost everyone else around them. In short, through work, effort, and sweat, Korea transformed itself from a war-torn mess to one of the richest countries in Asia. Is it any wonder Korean students work so hard? If you’re a student studying a foreign language, click here to learn about the Language Hacking Guide. Very interesting and informative. Your writing is very good. it’s too bored here in us!! and my friends are tooslow in math!! Hey Euiyon, thanks for stopping by. You’re right about the math. High school kids here are doing the same math as the middle school students I taught in Korea. god after reading this article,i feel kind of better, i think. i studied in canada for 3 years and i haven’t been to korea unitl now. i go to second year of middle school, but i was worried that i will be half dead in about a week. i guess i will be, but at least now i know that life won’t be as hard as it used to be back then. do teachers still hit kids?? I am a student in Korea but I have to disagree about the 10 PM thing. Yes, the government has stated that hagwons must close before 10 PM at most, however, majority of the hagwons still operate after that, even up to 1 or 2 AM. Students go to Self-Study rooms (dokseoshil; 독서실) to study by themselves until midnight and the average sleeping time we usually get is about 2-3 hours. We have to wake up earlier than 6:30 because our school requires morning exercises and students of the student council have to come to school earlier than that. Yes, we have summer vacation. It’s only about 2 months, though. However, winter break is longer than America and we have spring vacation one week after and then it’s a new semester. New grade levels start in the spring not autumn (unlike America) Korea does have its benefits and studying is actually not that bad. I’ve experienced going to school in America and Korea and I have to say, I prefer Korean school because what we learn is actually fun. I’m a Korean-American middle schooler and this post is pretty accurate, at least according to my parents (Seoul National University and Yonsei graduates 🙂 . The way my parents handle my education is basically like the way they do it in Korea, although less extreme. I usually get up a little before 8:00 (school starts at 9:05, I have to be there at 8:50). I go to a hagwon-type learning center twice a week for a total of 3.75 hours, and I also do ballet (4.5 hours a week), violin (2 hour lesson including commute and 1 hour practice five days a week), and orchestra (on Saturdays for 1.5 hours). I’m in a gifted program so I go to bed around 12:00 or 12:30 (the latest I had to stay up last year was around 1:30). Thanks for your comment, 문채현. I remember reading about government people cracking down on study rooms. I’m sorry to hear the situation is as bad as you say. It is quite depressing comparative to my high school. I attended a city public school and it lacked in educational material and study hours. We attended classes from 8:45am to 3:45pm. So classes were poorly taught, the books were outdated, we didn’t have study hall like other schools, and all in all, it was a very poor educational institution. Why did I attend? My mother was ill and I wanted to be close just in case something happened. There were a handful of students, like myself and several of my close friends, who were in top classes such as honors or advance courses, which is equivalent to any suburban high school academic level. It was awful. Me and my friends would meet on Saturdays at our school to get tutoring and study for exams with students from Loyola University. The opportunity was open to all upperclassmen but many didn’t bother. As students, we took the initiative to study more and challenge ourselves. There were teachers there who would help us to achieve the proper education needed to succeed and get into colleges. Our high school only prepared us to attend junior colleges. My friends and I would push ourselves to not attend such schools. We wanted to get into the best schools. We developed a support system. Many students believed that they were being educated enough and sadly, many dropped out, became young parents, ended up in jail or dead. I wish that the school administrators had pushed us and educated us properly. I also wished that more students demanded a proper education from the school and the city. Conversing with some of my friends and other students from school, I was able to see that many regret their choices. Not all my friend attended school or were able to get into top Universities, but a small amount of us were able to get into top universities and are doing well. We all have a common conclusion, our education at the city high schools did not prepare us for Universities and we all have had to double our studies in order to be on the same level as many of the students that attend our schools. I do wish that city officials, parents, and alumni would come together to create change. I can only pray that it becomes possible. As a Korean American, the fallacy of Korean Education is that it fosters competition without learning. Result..many Korean kids try to get big corporate job or gov’t job to veg. for rest of their life, instead of engaging in challenges and innovation. Recent newspaper articles shows that many kids shun away for science field, but choose to go to law or med school instead. So, there would never be a Korean Steve Job in Korea. I’m from holland, and i’m shocked of what I read. I’m going to a Univerity next year, I’m the best pupil of the class but I never have to learn that much. This blog will be lots of use to me when I begin teaching MSers next month! No nonsense, elaboration on the basics of teaching MS in Korea. When I was in high school I also felt that I was being jilted by the lack of quality in the education system. Even today it bothers me that I am not as educated as I could be. When I investigate magnet schools for my own job, or even getting to know the South Korean students I teach, it makes me glad to find what wonderful environments exist for people to learn in, but sad simultaneously since I did not get as good of a chance. But also, more than that I regret my own lack of proactiveness. For instance when I was in high school, I made lots of friends from Korea (hence in part my inspiration to live and work overseas). Also in college, I got into my school’s honor program and surrounded myself with motivated people from a fairly high class backgroudn. However, looking back I see I failed to make effort enough to absorb the good influence of these peers. For instance, in college our eventual valedictorian lived across the hall in my dorm, and we even got lunch together a few times, but I now know I should have learned much more from her. A support system is absolutely vital. Every young person needs a mentor they can confide in and who knows where they are coming from and going in life. It’s good to have an older sibling or at least a friend who can take on that role of earnest and frank confidant. However, some people don’t really have a lot of good influences in their environment, so the least thing they can do for starters might be trying to change their environment. For me, what this meant ultimately was moving overseas and making plans to stay there long-term, since in spite of culture barriers I foudn Korea to be a more supportive place of who and what I wanted to become. Even though people have to struggle to better the world, at the same time, no one is stronger than the entirety of the fact of the matter. For this, lots of human potential goes to waste due to nothing more than the fact that someone does not get a chance in the place where they are. But at the same time all human beings have soe power to take responsibility. Even if they don’tget a chance they can make title changes, gradually build their resolution and character and strength, along witht he wisdom and background knowledge needed to make a difference in their own life. So all those in lacking environments. First and foremost, you should try to spend time in the library because if nothing else the ambiance there should help to motivate you. If your school or public library has a degraded condition, then you can try a college/university library. The librarian there will almost certainly grant you a card as a communit member, if you can just show earnest willingness to learn. Few librarians are in it for the money nor do they all take a churlishly doctrinaire attitude towards obeying rules. These days, the world is full of opportunities for furthering your education through technology which doesn’t depend so much on place. Examples include Project Gutenberg, Wikipedia (for some articles), LibriVox, free courses from MIT and other prominent schools, and the better class of blogs and youtube users. Even though it cannot equal the impact of a positive environment including family support, friends, mentors, and the best of teachers, it can be a lifeline for those who have been robbed by other circumstances of their environment. For what it’s worth, also, I have found that Korean people are by and large willing to help out when you show that you want to better yourself int his regard. Youcan’t change your mind just by changing your climate, but youcan definitely detox by taking a distance from the corrosive influences that yo might have at home. And, overall while SK’s education system might have some flaws, the spirit towards schooling there is utterly admirable, and a pleasasnt surprise for many Westerners. Koreans. However, Finland is slightly different. the class and discuss it. I loved to sleep so I normally went to bed by 10.00pm (yes, yes..that’s way too early!). choose from. For example, there were 9-12 teachers for advanced maths alone. big with around 800 students. regarding to your experience, so it means that you prefer to the study life in Korea than America ? Do you really sleep that little or do you take enough naps in classroom? I really find It extremely difficult to believe that you sleep so little and still function. If It’s true, I’m amazed. Please tell me How can you do It, be able to think and still study. What do you do? I like to work hard and I have good discipline. But I’ve never figured out How to sleep less than 6.5 hours minimum.